Foundational skills – Students develop a deeper understanding of math concepts through an extensive set of assignments. Critical thinking skills – Students build on foundational skills through numerous word problems and problem solving assignments. Context-switching skills – Lymboo Math's unique mixed-review assignments enhance students' ability to recall and apply diverse skills, as in a test setting. Long-term retention – Lymboo Math's unique interleaved and spaced spiral review assignments effectively eliminate learning loss over time. Children are virtuosos as learners and they have an immense appetite for knowledge. They also have diverse instructional needs. An optimal learning program for a child needs to be guided by the child's aptitude and prior knowledge. To that extent, Lymboo Math is a personalized and adaptive learning program that keeps pace with a child's learning requirement. The objective of Lymboo Math program is to provide them the tools they can use to become independent learners, and eventually excel and thrive. Lymboo Math program is very effective in practice because it integrates best known practices and research, a thorough curriculum, an extensive set of assignments that span different perspectives: basic, applied, critical thinking, and problem solving, and a relentless pursuit of proficiency and retention. Children start Lymboo Math program with a set of diagnostic tests designed to gauge their level of existing knowledge. This evaluation helps to identify a comfortable starting point within the curriculum. Children progress along the curriculum by doing daily practice assignments intended to promote deeper understanding of the topic they are learning. These tests are timed and the children are required to achieve proficiency before progressing to the next topic. 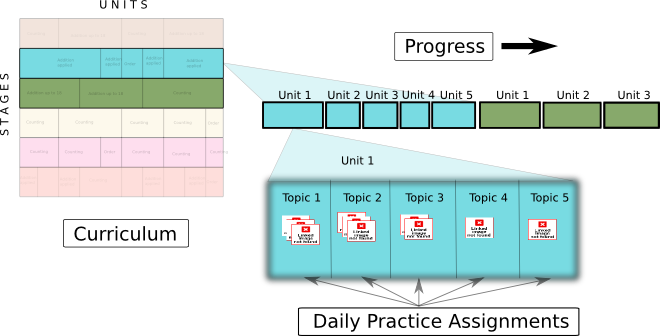 In addition to daily practice assignments, they are assigned periodic spiral review assignments aimed at promoting long-term retention, and thus reducing the need for the topics to be retaught in the future. Parents and mentors have up-to-date information on their child's performance through reports and analysis. The path to excellence begins with an accurate assessment of existing knowledge. We believe that any child enrolled in a comprehensive and rigorous learning program should begin at a level that reflects the child's existing knowledge. A comfortable starting point ensures the early successes that are so crucial to building self-confidence. A confident child is motivated to be a self-learner and will eventually succeed in the program. Practice isn't something you do once you are good. It's the thing you do that makes you good! The daily practice assignments are the centerpiece of Lymboo Math program. Practice assignments are structured to promote deeper understanding of math concepts, which in turn leads to proficiency. A practice assignment has problems from one of the four categories: basic concepts, applied, critical thinking, and problem solving. Practice assignments consist of problems from one topic and takes 15-20 minutes to complete. 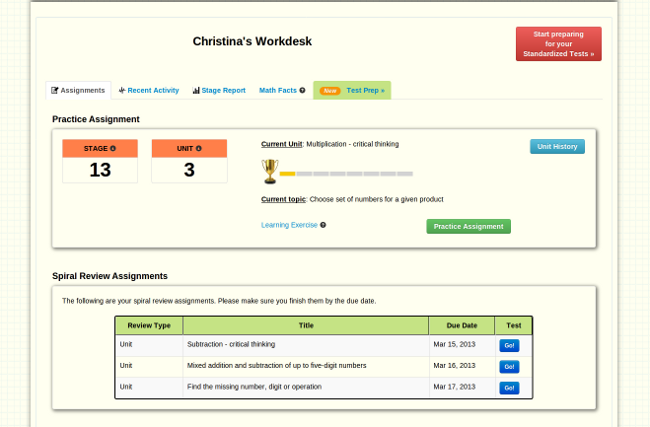 Assignments are completed online and the results are available immediately after completion. Students advance to the next topic in the curriculum after they demonstrate proficiency – as measured by LyQ score – in their daily assignments. 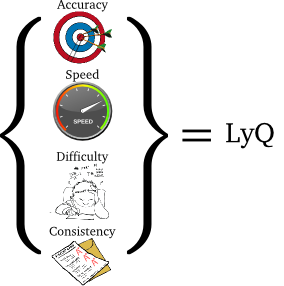 The LyQ score is computed by our proprietary algorithm, which considers accuracy, consistency, problem difficulty, and time to complete an assignment. If proficiency is not demonstrated on any given assignment, students will have the opportunity to improve their score with more follow-up practice assignments. Continuous and deliberate reinforcement is key to long-term success. The unique structure of Lymboo Math provides continuous reinforcement of learned math concepts through out the program. While daily practice assignments provide ample practice to promote mastery of a concept, it's the periodic and progressive spiral review assignments that ensure long-term retention. This combined methodology makes it less likely for students to forget what was learned, and also diminishes the need that those concepts be retaught in later years. The composition of review assignments, by their very nature, enhance context-switching skills and reinforce a child's understanding of foundational concepts. 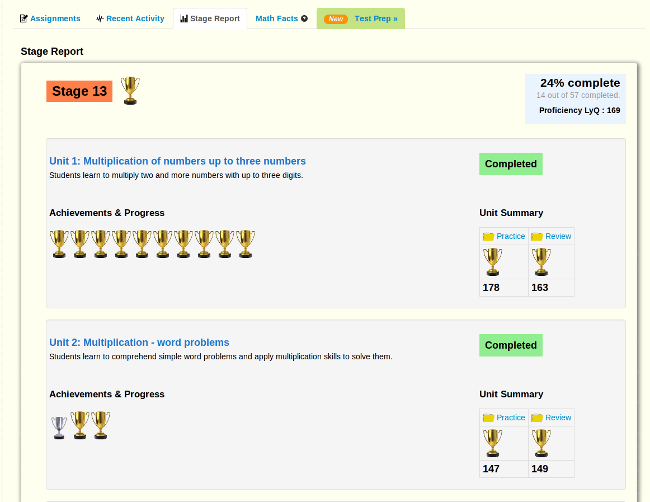 For best long-term retention, Lymboo Math program incorporates two sets of spiral review assignments. Unit Review. This is a short-term review assignment, scheduled and administered automatically two weeks after the completion of a unit. It reviews problems from all topics of that unit. The assignments are due in seven days. Stage Review. This comprehensive long-term review assignment is scheduled six weeks after the completion of a stage. The assignments are due in two weeks. In Lymboo Math program we measure proficiency not alone by the score on a given assignment, but as an aggregate of key factors such as, accuracy, speed, difficulty of problems, and consistency across assignments. This aggregate is called the LyQ score. The calculation algorithm is designed to reflect overall proficiency for a given topic, unit or stage. 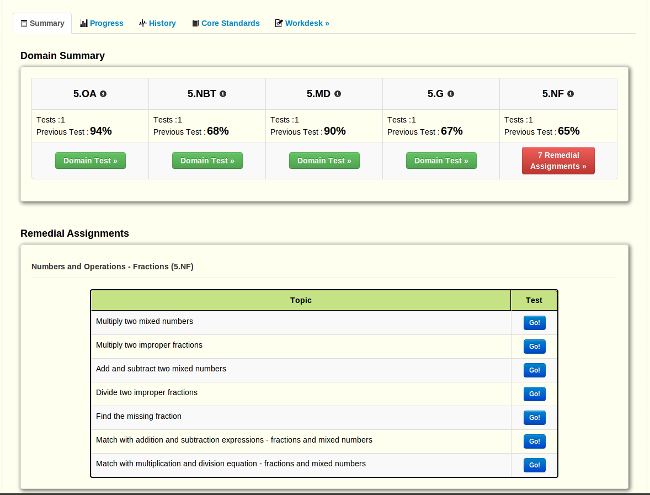 Throughout the program, LyQ score is calculated and assigned to topics, units and stages. In addition to the key aspects mentioned above, LyQ score also takes into account problem category and average proficiency level among students within similar age or grade level. LyQ score is comparable across the students, topics, units, and stages. LyQ score of 100 indicates proficiency level that is average for a group of students of similar age or grade.